An Airbus A340 airplane of Mahan Air is seen at Simon Bolivar International Airport outside Caracas, Venezuela, April 8, 2019. Iran's Mehr news agency quoted the spokesman of Iran's Civil Aviation Organization Reza Jafarzadeh as saying a delegation from Mahan Air was traveling to Caracas to discuss maintaining regular flights between the two countries. The nonstop Tehran-Caracas flight would take 16 hours. A Reuters photographer saw a Mahan Air plane parked at Caracas' main Maiquetia airport on Monday morning. Mahan Air, established in 1992 as Iran's first private airline, has the country's largest fleet of aircraft. The United States imposed sanctions on the company in 2011, saying it provided financial and other support to Iran's Islamic Revolutionary Guards (IRGC). France and Germany banned the airline's flights earlier this year, accusing it of transporting military equipment and personnel to Syria and other regional war zones. Iran has voiced support for Maduro, who faces demands from the opposition and the United States to step down. Russia, China and Turkey have also backed Maduro. 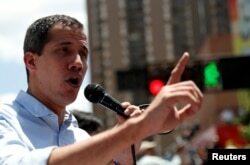 The U.S. government has recognized opposition leader Juan Guaido as Venezuela's interim president. Most Latin American countries have done so as well, while European governments have cautiously thrown their support behind Guaido. Venezuelan opposition leader Juan Guaido, whom many nations have recognized as the country's rightful interim ruler, attends a rally against Venezuelan President Nicolas Maduro's government in Caracas, April 6, 2019. Since Guaido began a campaign in January to oust Maduro, whom he denounces as illegitimate, Chinese and Russian planes have flown supplies and military personnel to Venezuela in support of the government.